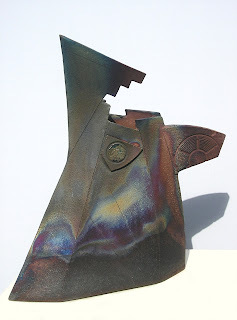 The online Blog from Uk Raku potter, Shaun Hall. Chelmsford Museum in Essex contacted me recently regarding the acquisition of a piece into their Studio Pottery Collection. I will be creating a special piece based on my "Nuclear Jug" series. This will become part of the Museum's permanent collection, which already includes works by Joanna Constantinidis, Robert Washington and a piece by Grayson Perry. More on the progress of this "special pot"- its design- creation- and firing as it develops!! My connection to Mo was as a student at Middlesex University in the dog days of the ceramics course during the 90's. He was my personal tutor for four years. Diminutive of stature and blinking in the funny way he did, we all came to love him as a tutor. Middlesex then, had a reputation for slip casting and mold making, and I was awful at both! Instead I had more of an interest in sculpture rather than functional tableware. Mo seemed to take an interest in my progress. He was very perceptive of individual students' abilities and offered guidance without ever dominating the discussion. He could be critical of course, but in such a way that was constructive and not "dead ended." I've been blathering on about Crater and Lava Glaze recipes here and on Facebook too. I suddenly "got the bug" as well as a commission- (more on this later) so hence the rather manic activity testing out glazes and destroying kiln shelves in the process with runny, bubbling glazes. Lots of new work is now up and online at #Artintheheart. This is a great site founded by Dawn Birch James, and has an eclectic mix of British arts and crafts. She's looking for new talent and especially Potters! Have a look at my store for decorative Chawans and bowls. Uk based ceramicist specialising in copper matte, textural and glazed Raku. Beecroft Art Gallery - new work on show!